I’m not a big fan of shark meat to be honest, but this mako shark recipe does stand out. It’s pretty darn yummy. It looks bit like swordfish but definitely has a softer flesh. So treat it a bit more delicately than you would swordfish. I have tried freezing it, but have not had much success as appears to get softer as time goes on. So if you were lucky enough to have a heap of it, I would not freeze it more that 30 days, you can always share some with your eager friends. Lightly sprinkle seasonings on both sides of fish, then place it tightly in plastic wrap so that the spices will impregnate the fish. Refrigerate for at least 30 minutes (up to 2 hours). Remove from refrigerator 15 minutes prior to cooking. Pan fry over a medium heat about 5-6 minutes a side, until fish is flaky but not over done. Remove from pan and keep warm. Using the same pan that the fish was cooked in, add the above ingredients and simmer, stirring frequently. Reduce until sauce thickens slightly. Serve the fish on the sauce and garish with fresh lime wedges and Sriracha sauce for those that like a bit of heat. 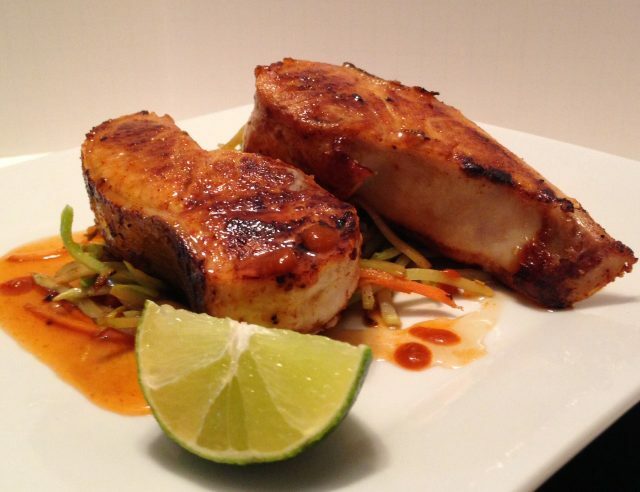 If you liked this Mako Shark Recipe check out all of Maggie Rosaines recipes on BD Outdoors.